We know how important our data is. For videos and photos of our wonderful moments with our families and friends that we record, it will be heart-breaking if we lose them. If you have a great journey in Russia during the 2018 FIFA World Cup, I highly recommend you to backup World Cup 2018 videos, recordings and photos and I recommended four ways for you do so! But what if we lost the data? Can we recover videos/recordings and photos as well as other data? Below is my Wondershare Recoverit review along with a guide on how we can recover data with it. Wondershare Recoverit-a professional data recovery software produced by global software developer Wondershare that can fully recover deleted and formatted data from NTFS, FAT/exFAT, Ext2FS/Ext3/Ext4UFS, HFS and recover data from HDD, SSD, RAID, SAN, DAS, USB Drive, SD Card, Memory Card, Camera & Camcorders, Music Players, External Disk etc. Wondershare Recoverit is superb in the algorithm, making it a 96% recovery rate from multiple situations and it is easy to use. For any reason your videos, recordings, photos or other kinds of data like PDF, DOCX, PPT, MP3, emails etc are lost, no matter where they are stored like HDD/SDD on your PC or Mac, right in your iOS/Android phone, or in your camera, DV or HD camcorder, you find the right place to recover them! And I have a step-by-step guide on how you can recover lost videos, photos or other data! 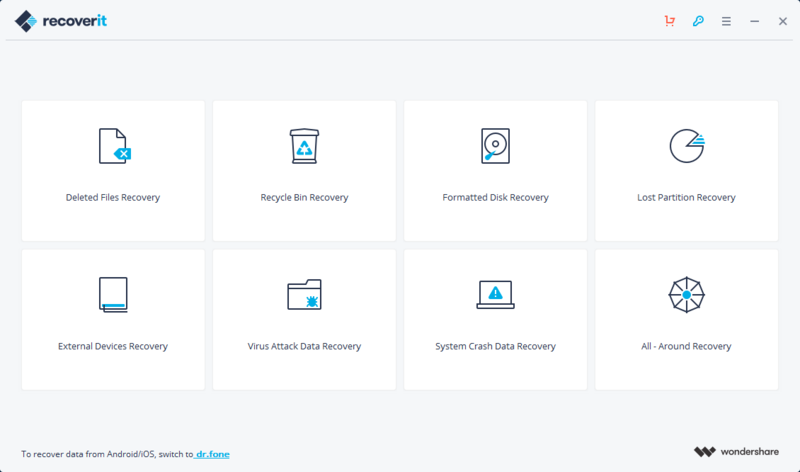 Wondershare Recoverit offers 8 conditions of data recovery. You can recover lost videos, recordings, photos and other data with Deleted Files Recovery, Recycle Bin Recovery, Formatted Disk Recovery, Lost Partition Recovery, External Devices Recovery, Virus Attack Data Recovery, System Crash Data Recovery(Windows only) and All-round Recovery. If you format your hard drive without backing up your videos and photos, go for Formatted Disk Recovery to recover, and if you delete data accidentally, go for Deleted Files Recovery. If you are just not sure which recovery mode to go, or totally forget how you lost the data, go for All-round Recovery. Each recovery mode works more or less the same and I will take External Devices Recovery as an example to show you how to recover lost videos, recordings or photos right from your cameras, HD camcorder etc as I assume this is the one you probably need. Go for a recovery mode you need. Here we go External Devices Recovery to recover the recordings and photos we take in Russia 2018. You then need to connect your external device and click Next for scanning. Wondershare will list the devices you connect to the computer and click start to scan your lost videos, recordings and photos from your USB drive, SD card, digital cameras, HD camcorders etc. After scanning, you will find there are a lot of files that can be recovered on your device. Customize a possible modified date so you can easily find your lost videos and photos. You may able to preview your data, but if not, no worry, just check them and hit Recover button! macOS 10.13 High Sierra seems to be a very special operating system from Apple. It is the last macOS that supports 32bit apps including DVD rippers. And removing DRM from iTunes movies, TV shows are not possible on High Sierra, luckily there is a workaround, complex but it works. When it comes to data recovery on macOS High Sierra, and Mojave, you are into trouble as Apple doesn’t allow apps to get access to the built-in system drive and you will have to disable the System Integrity Protection. As an important security feature, it is NOT recommended to disable the protection, but if you have to do so in order to recover your lost videos, recordings, photos you have, there is a detailed guide from HowToGeek. And my suggestion is to enable it AGAIN IMMEDIATELY after you restore your lost data. Anyway, if you have already disabled System Integrity Protection, recovering data like videos, recordings, and photos is now possible and as easy as we do on Windows. Just choose a recovery mode, let Wondershare scan your data, locate the one you want to recover, and hit the big Recover button. I know how annoyed it would be after a blue screen or system crash of Windows. If your Windows is no longer bootable, please DON’T try to format or re-install the hard drive before you successfully recover your lost videos, photos or recordings, or your recovery rate will decrease. Wondershare Recoverit offers a way to create a bootable WinPE for you to recover data from unbootable Windows. And Wondershare has already had a detailed guide on how you can do so. Also, you can disassemble your hard drive from your PC or laptop and use another computer to recover. You may notice Recoverit does not support data recovery from iOS or Android devices but Wondershare does have a program called Dr.Fone that is able to recover lost videos, photos, recordings, PDF, emails, sideshows etc from your iOS and Android devices. And I have been using it successfully to recover data from Galaxy S9. Dr.Fone is a collection of iOS or Android tools for you to recover, transfer, backup and restore, switch, erase etc and Recover is the featured function of Dr.Fone. You can only activate the function module you need. ← How to Make Any Video a VR Video with Best VR Video Converter 2019 on PC and Mac?